A guide explaining the health and climate risks posed by the massive proposed methanol facility on the banks of the scenic Columbia River near Kalama, Washington—and how we can stop it. The location of the proposed petrochemical refinery, on the Columbia River near Kalama, Washington. 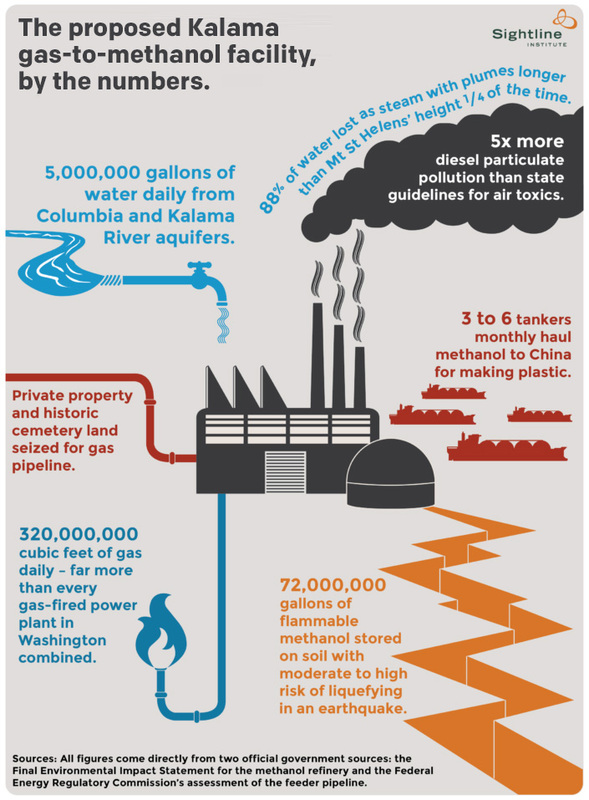 A guide explaining the health and climate risks posed by constructing a massive methanol-producing facility on the banks of the scenic Columbia River near Kalama, Washington. A volatile liquid alcohol, methanol is used in the production of gasoline and other fuels, and in a wide variety of products, such as plastics and paints. What is the proposed facility? The petrochemical refinery would be larger than any currently operating methanol facility in the world, and would use more natural gas each day than all of the power plants in Washington combined. It would manufacture methanol from natural gas and ship it to China to make plastics. The refinery would produce up to 3.6 million metric tons of methanol per year. 1. It would have a devastating impact on the climate. The proposed Kalama facility would emit more than a million tons per year of climate pollution as part of the manufacturing process alone. Shipping the methanol to Asia would generate hundreds of thousands of additional tons per year of climate pollution. And, the methane emitted by fracking and pipeline transport to supply the facility would make the greenhouse gas impacts skyrocket even higher. 2. It locks us into future fossil fuel use. The plant would use a huge amount of natural gas—approximately 300,000 dekatherms per day—more than all of the gas-fired power plants in Washington combined. This huge new demand for gas will lead to new gas well drilling and fracking, and new regional pipelines that lock in future fossil fuel use for decades, at a time when we need to phase out our reliance on fossil fuels in favor of clean energy. 3. It would be bad for our health now. 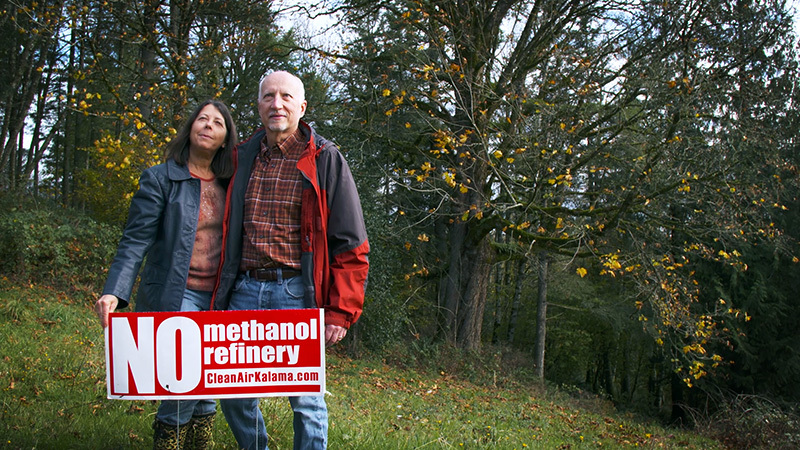 The Kalama methanol refinery would emit a wide range of hazardous air pollutants including ammonia, carbon monoxide, nitrogen dioxide, among others. For instance, the facility’s emissions for diesel particulate air pollution would exceed the state’s acceptable levels (ASILs) by five times. Scientists have warned that we’re at a climate tipping point. A new source of pollution like this one moves us a giant step farther away from the clean energy future we can and must build. What would happen to the landscape? And to public safety? 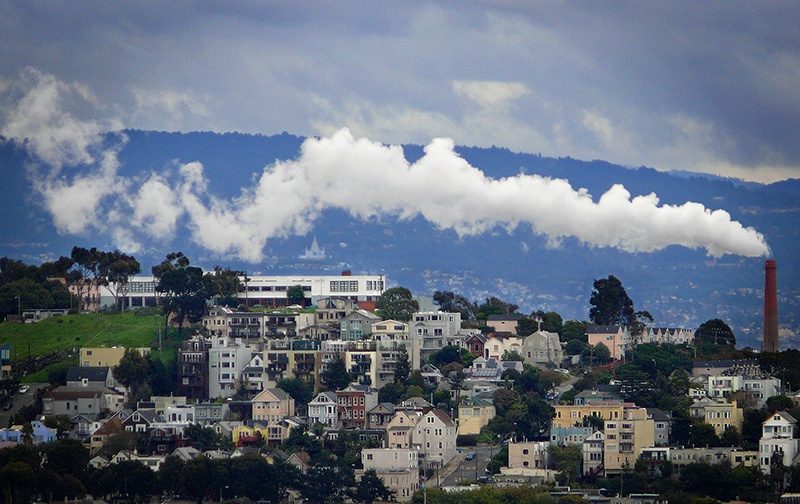 Steam plumes far larger than this one would be emitted from the refinery. 12% of the time, the plumes would stretch nearly as long as Alaska’s Mount Denali is tall. Additionally, 72 million gallons of flammable methanol would be stored on soil with moderate to high risk of liquefying in an earthquake. A big quake and soil liquefaction could damage structures at the refinery and kill or injure workers. 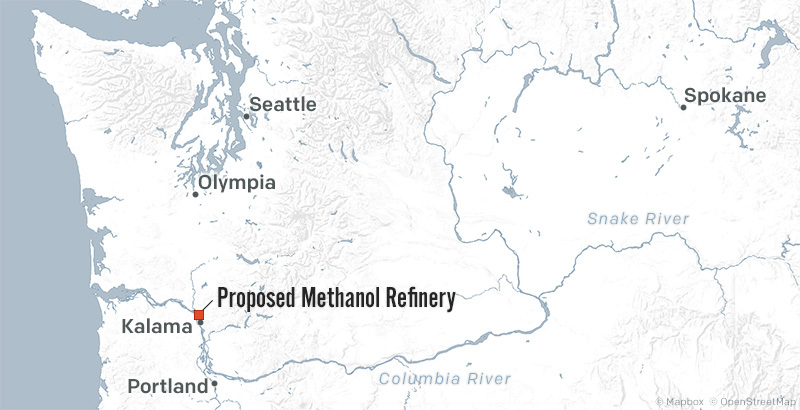 Spreading of flammable methanol would likely affect other project elements located on the Columbia River. Would this affect the iconic salmon and orca of the Northwest? Three to six tankers per month will carry the refinery’s product down the Columbia River and across the bar at Astoria en route to China. The massive new facility and vessel traffic would further harm endangered salmon that are already stressed by dams, other pollution. It would also increase risk of ship strikes that harm or kill whales near the mouth of the Columbia River. 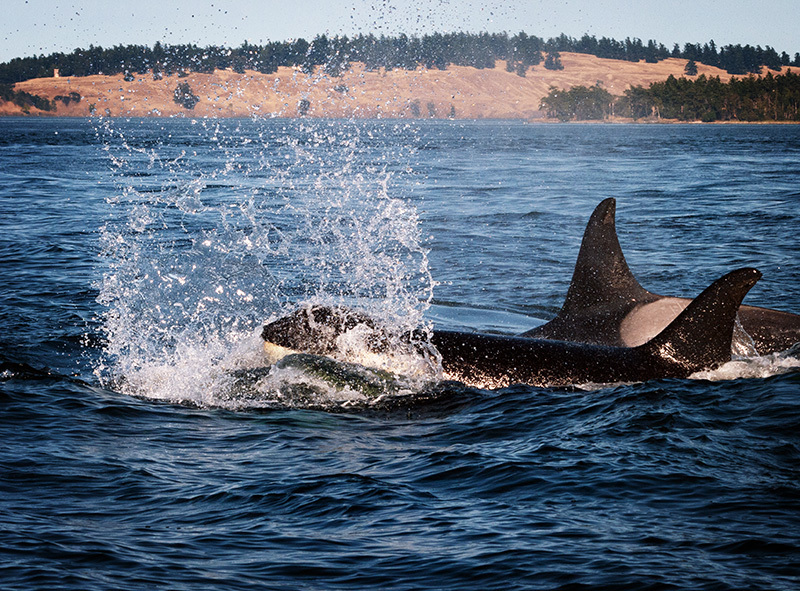 Members of K Pod swim near San Juan Island, September, 2011.
Who is opposed to the proposed Kalama refinery? Communities in Washington and Oregon have been standing up to huge fossil fuel export projects for nearly a decade—and they’ve been winning. The fights against coal exports and crude-by-rail are ongoing, but the Pacific Northwest is standing strong as the Thin Green Line of states opposed to massive fossil fuel exports, and multiple projects have been stopped in their tracks. 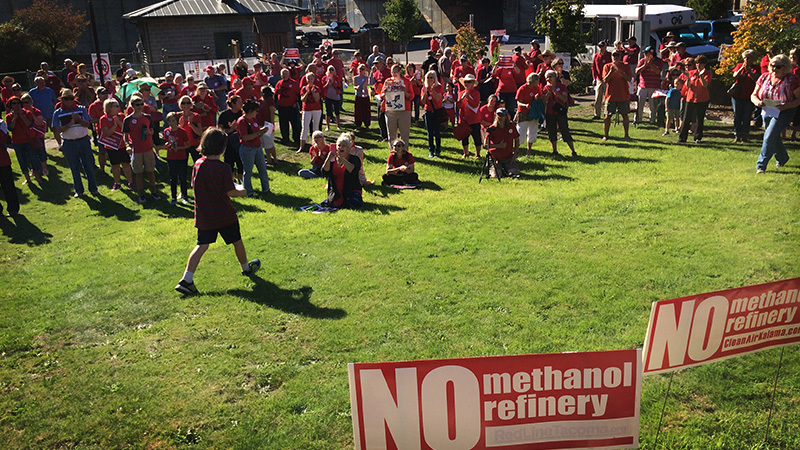 Another methanol export facility proposed in Tacoma, Washington was abandoned in the face of community opposition. Earthjustice is representing Columbia Riverkeeper, Center for Biological Diversity, and the Sierra Club in litigation against the proposed Kalama refinery. 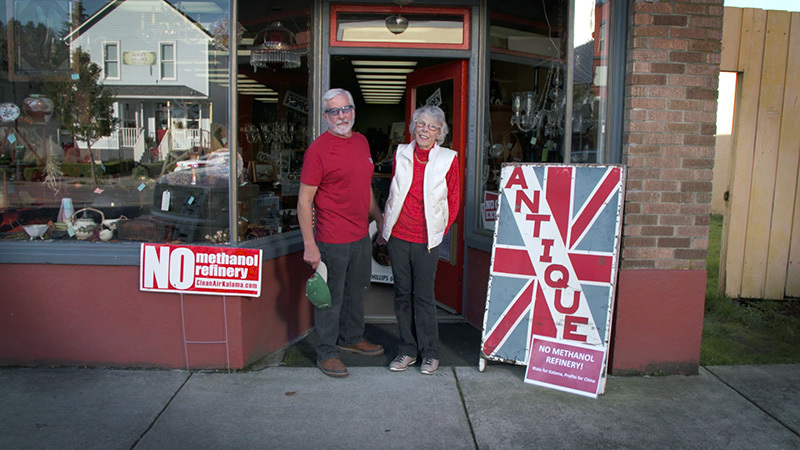 The case is part of Earthjustice’s docket of work fighting industry’s attempts to turn ports in the Pacific Northwest into hubs for shipping coal and crude oil to international markets. 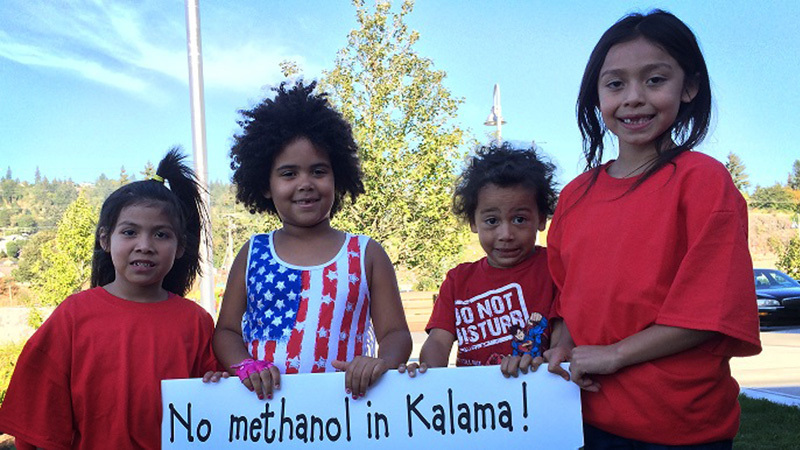 On June 29, 2017, a coalition of local and national groups—Columbia Riverkeeper, Sierra Club and the Center for Biological Diversity, represented by Earthjustice—challenged two permits for the Kalama methanol refinery. 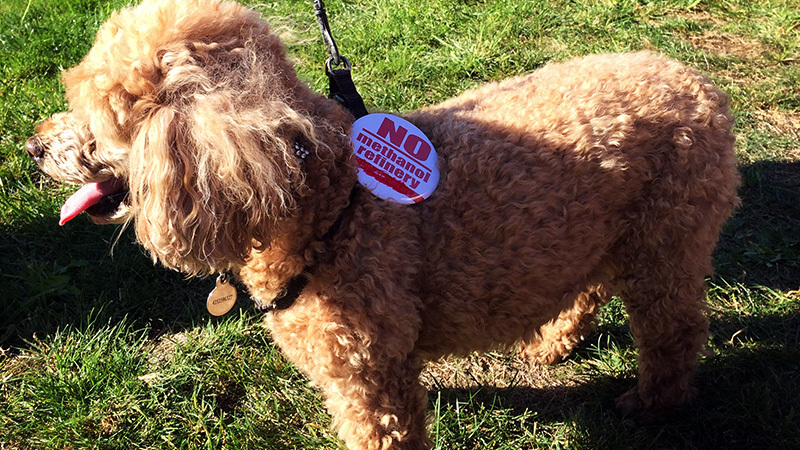 The coalition filed an appeal with the Washington Shorelines Hearings Board because the permits fail to address threats to climate, safety and public health. 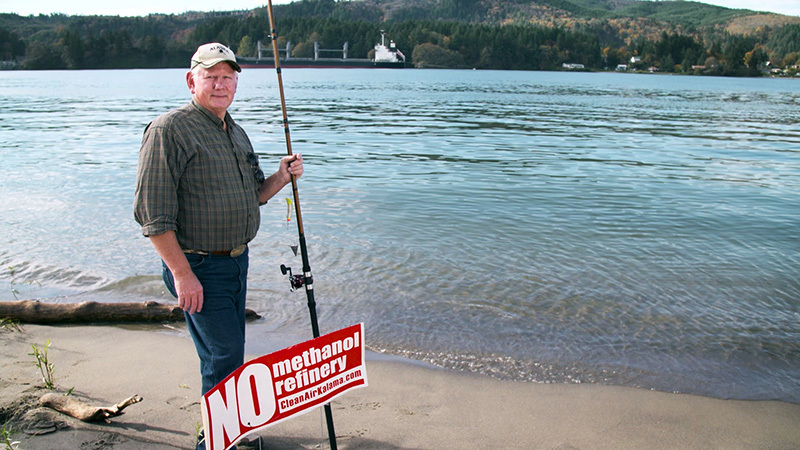 The Shoreline Management Act permits, approved by the Washington Department of Ecology earlier in June, would allow the Port of Kalama and Northwest Innovation Works LLC to build the massive methanol refinery in the Columbia River shoreline. On May 8, 2018, the Cowlitz County Superior Court upheld the Washington Shorelines Hearings Board’s decision that the Port of Kalama and Cowlitz County broke the law by failing to disclose and evaluate greenhouse gas pollution from the proposed Kalama methanol refinery. Yes! 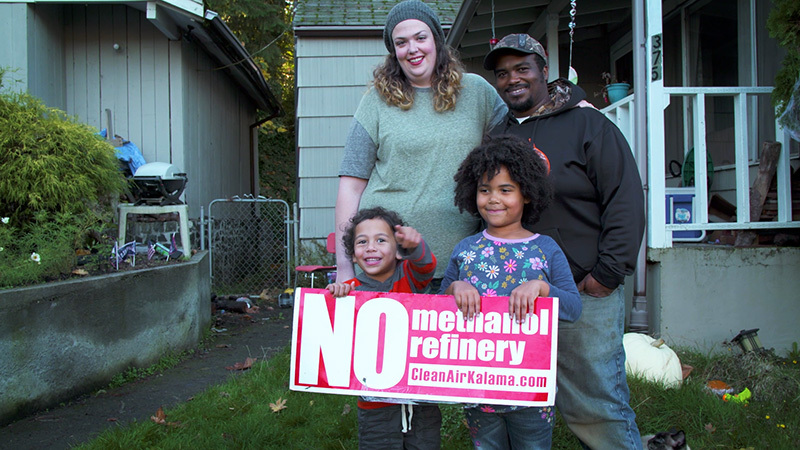 Until February 6, you can participate in the public comment through Columbia Riverkeeper's action page on the draft air pollution permit for the Kalama methanol refinery. 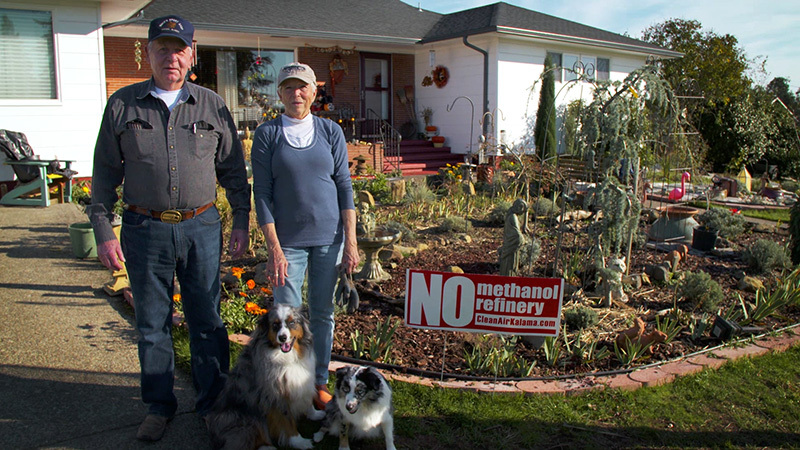 an important public hearing will be held regarding permits for the construction of the Kalama methanol refinery. The hearing will take place at Cowlitz County Fairgrounds & Event Center in Longview, WA. Everyone concerned about the methanol refinery is encouraged to attend. Find more information about the hearing at Columbia Riverkeeper's event page.